Black History Month is February. Women’s History Month is March. 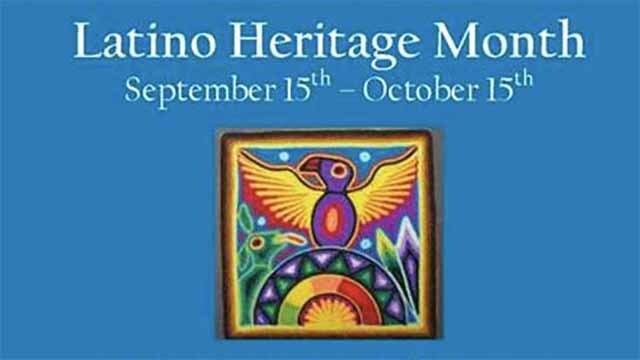 So why does Latino Heritage Month take in the second half of September and the first half of October? 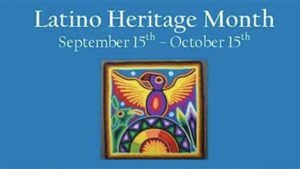 As Grossmont and Cuyamaca College organizers of East County celebrations recount, President Reagan signed “Hispanic Heritage Month” into law on Aug. 17, 1988. Sept. 15 was chosen as the starting point because it’s the anniversary of independence of Costa Rica, El Salvador, Guatemala, Honduras and Nicaragua. Mexico and Chile celebrate their independence days Sept. 16 and Sept. 18. This year’s events include the Grossmont College Latino Film Festival. All events are free and open to the public. Thursday, September 15, from 11 a.m. to 1 p.m. in the Main Quad, Grossmont College: History professor Carlos Contreras will share the history of 16 de Septiembre, Mexico’s Independence Day. Music provided by Mariachi Imperial de San Diego. HOLA Club will be selling food. Thursday, Sept. 15, 11:30 a.m. to 1:30 p.m., Cuyamaca College in front of B Building: Cuyamaca College holds an entertaining Latino Heritage Month Celebration with a keynote address by longtime educator Maria Garcia, author of “The History of Neighborhood House in Logan Heights;” Mariachi Garibaldi; DJ Eflex; a Food Fest and free salsa bar from Sarita’s Taco Shop. Tuesday, Sept. 20, 10-11 a.m., Cuyamaca College Cross Cultural Center, I-128 in the Student Center: Dr. Tanis Starck, director of Intercultural Relations at San Diego State University, will lead a Latino Heritage Celebration Workshop presenting Latino/Hispanic Americans as an ethnic group, rather than a racial group, comprising individuals from over 20 different countries. Tuesday nights, Sept. 20-Oct. 11, 7 p.m., Grossmont College Bldg. 26, Room 220: The Latino Film Festival explores Latino/a culture and history and is coordinated by the Latin@ Alliance. The free screenings are at 7 p.m. every Tuesday Sept. 20-Oct. 11 in Building 26, Room 220 at Grossmont College. For a listing of films, see gcccd.edu/news/2016/09/06-latino-film-festival.html. Wednesday, Sept. 21, 10 a.m.- noon, Grossmont College Griffin Gate, Building 60: Multi-disciplinary artist and filmmaker Bocafloja will present his new documentary “Nana Dijo,” about race relations, the decolonial narrative and the African diaspora in Latin America studies. A Q&A will follow the presentation. Thursday, Sept. 29, from noon to 1 p.m. in Grossmont College’s Main Quad: Ballet Folklórico Real de San Diego performs traditional Mexican dancing. Club EOPS will be selling food. Thursday, Sept. 29, from 2-3:15 p.m. in Grossmont College Griffin Gate: Matt de la Pena, first Latino winner of the Newbery Award, leads a discussion of personal identity, American culture and free speech as part of Banned Book/Banned Lives week. Sponsored by The World Arts and Cultures Committee. Oct. 6-8 and Oct. 13-15 at 7:30 p.m. and Oct. 8 and 15 at 2 p.m. at Grossmont College’s Stagehouse Theater: “Blood Wedding,” a play by Garcia Lorca about a family feud driven by the death of one father at the hands of the other. Performed in English and Spanish. For tickets, call (619) 644-7234 or purchase online at grossmont.edu/theatrebrochure. President Ronald Reagan signed Hispanic Heritage Month into law on Aug. 17, 1988. Sept. 15 was chosen as the starting point because it is the anniversary of independence of five Latin American countries: Costa Rica, El Salvador, Guatemala, Honduras and Nicaragua. Mexico and Chile celebrate their independence days on Sept. 16 and Sept. 18. Grossmont College is at 8800 Grossmont College Drive and Cuyamaca College is at 900 Rancho San Diego Parkway in Rancho San Diego.